I’ve always loved Jumanji. Not only is it based on a book by Chris Van Allsburg, my favorite children’s book illustrator, it’s also a lot of fun and full of non-stop action. This was a movie that easily captured my attention as a kid, and is still enjoyable to watch now. Jumanji is about a magical board game that comes to life when it is played. The results of playing the game are extremely disastrous and dangerous, and only cease once a player wins the game. I loved board games as a kid, so that aspect of the book and film are what appealed to me the most. How cool would it be if your favorite game came to life? Though, my favorite games when I was 9 or 10 were Monopoly and The Game of Life. They’re basically real once you reach adulthood and far less exotic than charging rhinos and crazy big game hunters. The success of this movie is rightly credited to its cast. 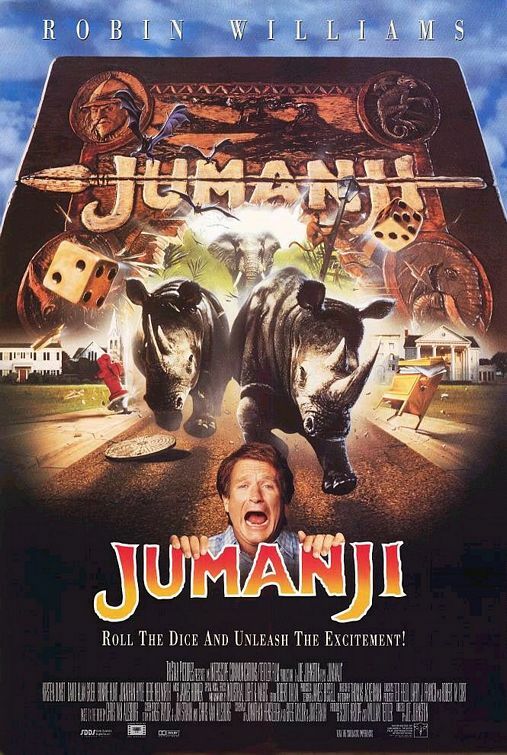 Robin Williams stars as Alan Parrish, a boy who was sucked into Jumanji as a child and only released decades later when two new children continue the game he started. I would actually classify this as one of Williams’ more serious roles, as he uses his dramatic acting chops more than his comedic ones. Williams is playing a child stuck in an adult’s body, but there is nothing lovable about how this character is portrayed. Alan is a serious child, bullied at school by bigger boys and bullied at home by his father. Getting trapped in the frightening world of Jumanji hardens him further. There are some moments of humor and levity from this character, but overall it is a rather serious role for a children’s movie. Williams is supported by veteran actors Bonnie Hart, David Allen Greer, and Bebe Neuwirth. All do a wonderful job, and look like they’re having a lot of fun with this crazy story. Another stand out is Kirsten Dunst, already a pro herself after co-starring in Interview with the Vampire and Little Women the previous year. As much as I loved the sadistic Claudia in Vampire, it’s nice seeing Dunst play a more normal kid in Jumanji. I also loved Jonathan Hyde, who plays both Alan’s strict father and the relentless big game hunter who springs from the board game. The only criticism I have of Jumanji is that the CGI and some other special effects have not aged well. A strong storyline and great performances make up for a lot of the deficiencies, but it’s still distracting how bad some of this looks now. Jumanji is a favourite of mine. An original plot and a great cast are huge plusses, despite the fact that over the years, the computer generated effects look incredibly dated. In the 1960s, Alan Parrish (Adam Hann-Byrd), a constantly bullied young boy, finds a board game buried in a construction site. He begins to play the game one night with his only friend, Sarah (Laura Bell Bundy). He quickly learns that the board game is a lot more dangerous than he first realised and anything that occurs during the game happens in real life. When Alan is sucked into the board game, Sarah runs out of the house screaming. The game lies dormant for thirty years until Judy and Peter Shepherd (Kirsten Dunst and Bradley Pierce) move into the old Parrish house with their aunt (Bebe Neuwirth). Judy and Peter begin to play the same game that Alan and Sarah started all those years ago. Eventually Alan (now thirty years older and played by Robin Williams) is freed from the board game and ready to resume the game. In order to finish they must now find an older clinically depressed Sarah (Bonnie Wright) and end the game together. This film is a lot of fun. I mean who hasn’t been playing a board game and wished it would come to life? It sounds good in theory, but as this movie shows, it can be quite destructive. The cast is great, led by the always brilliant Robin Williams. He works well as the middle aged man that has been trapped in a forest for thirty years. I liked his chemistry with the kids, and also with Bonnie Wright. I like Wright a lot, she is always underrated in my opinion, normally playing second fiddle to bigger stars like Steve Martin in Cheaper by the Dozen or Robin Williams in this film. Don’t underestimate her though, every good comedian needs a good straight man and Bonnie Wright is more often than not up to the task. My only complaint about this film is that the special effects to look really dated. The shots of jungle animals rampaging through the streets look really bad. The film was made when CGI technology was in its infancy, and I am sure these images looked great when it was released in the mid-90s, but by today’s standards, they just aren’t good enough. They are distracting, but not enough to ruin what is still a very fun film for the whole family.